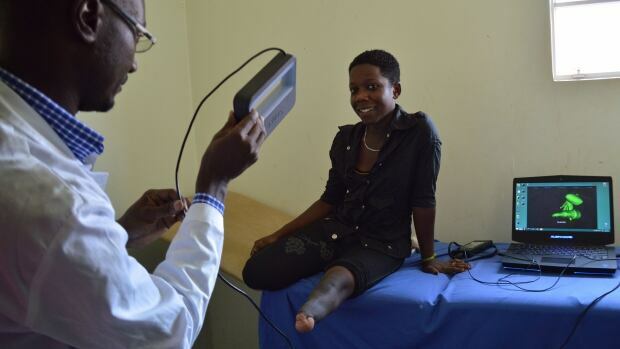 Researchers provide world’s first functional 3D printed prosthetic legs to Ugandans. Canadian researchers and a 3D printer are making medical history in Uganda. The Canadian team from the University of Toronto recently helped a young Ugandan woman walk with the world’s first functional 3D-printedprosthetic leg socket, the critical customized element that is the main component of an artificial limb. “It makes me feel proud … it’s prestigious,” says Ruth Nakaye, the 20-year-old from Kampala who received the team’s first prosthesis. During a five-day visit to Kampala in January, the researchers used a 3D printer to make sockets, the customized part of a prosthesis that attaches to an individual’s body and forms to the thigh for those with amputations below the knee. They then connected the sockets to the standard pylons and feet that the Red Cross provides for prosthetics in developing countries to complete the replacement limbs. MattRatto, a Toronto professor and principal investigator for the project, says he believes this combination is the world’s first3D-printedleg to be used outside laboratories and test environments. The Canadian researchers are working with Christian Blind Mission Canada (CBM) and Ugandan prosthetists to make limb replacements more affordable and help alleviate the shortage of technicians in developing countries. 3D printing technology has a number of benefits, the team says. It makes the production of prosthetic limbs more efficient, saving time and money for the patient, which is particularly important in places like Uganda where many people have very limited incomes. It also allows the small number of Ugandan prosthetists to handle more cases than they could with the time-consuming manual plaster method, says Ratto. Nakaye, who was born without her full left leg, says she was excited to wear her new 3D-printed prosthesis home. Prosthetics have allowed her to play sports and attend school. Nakaye missed two years of primary education because she lacked mobility until a charity paid for her first artificial limb, she says. Unfortunately, Nakaye’s story is not uncommon in her country. The majority of those with physical disabilities can’t accessprosthetics because of the cost, saysDolorenceWere, executive director of the Uganda Society for Disabled Children. It’s difficult for many Ugandans – 38 per cent of whom live on less than $1.25 US a day – to pay at least $300, excluding hospital fees and travel expenses, for a prosthesis, says Mitchell Wilkie, CBM’s director of international programs. Children also grow an average of 2 centimetres a year, and generally need a new prosthesis every six months or so. Patients and their family often need to spend a week at a hospital and make recurrent visits to get fitted for a new prosthesis. But in Uganda, where 86 per cent of the population survives on subsistence farming, many locals can’t afford to pay for prostheses or take time away from their fields, says Wilkie. Roseline Cheptoo, 4, also received a 3D-printed prosthesis from the Canadian researchers. It was her third week-long visit for prosthetic fittings, and her family travelled more than seven hours from Amudatdistrict in northern Uganda to reach the hospital in the capital city. The main issue for Ugandans, however, isn’t the cost of prosthetics or hospital services, Ratto says. It’s access to skilled people who can fit them. 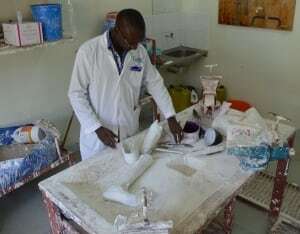 Studying to become an accredited prosthetist or orthopedic technologist who can make prostheticstakes at least three years, says MosesKaweesa, who studied the skill at Makerere University in Kampala. The World Health Organization (WHO) reports that in the developing world, there’s a shortfall of 40,000 prosthetic technicians. It adds that it would take 50 years to train just another 18,000, according to a 2003 study. There are approximately 12 prosthetic technicians in Uganda, according to CBM. 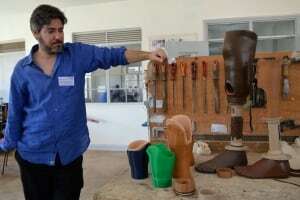 And there are about 10 facilities where prosthetics can be made in the country, adds Malcolm Simpson, chief executive officer of the project’s partner hospital. This is where 3D printers could help. Currently, it takes three to six days to use plaster to create a negative cast of a residual limb, fill it and mould a prosthesis, explains AbdullahIssa, a local prosthetist. Adjustments are often needed, meaning more manual work. “The 3D technology we’ve introduced in Uganda cuts this work down to as little as six hours,” saysRatto. It takes just a few minutes to do a 3D scan of a residual limb and use software to shape the prosthesis. Then the printer takes a few hours to produce the customized socket from the scan. The time saved compared to traditional methods of producing a socket will allow prosthetiststo see five to six times more patients a week,Ratto says. The time-saving technology is also affordable enough that it can be used by facilities in developing countries. 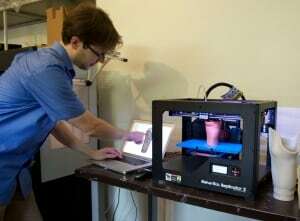 “The consumer-grade 3D printers that we’re using cost $2,000 and $6,000 – and the software, MeshMixer, is free,” explains Ratto. The Ugandan project will continue over the next six months as the Toronto researchers study the comfort and durability of the 3D-printedsockets, he says. And he adds that the project should benefit patients in Canada as well.